In the picture: Tim Mauro, far right, assists a student (center) and volunteer (far left) with putting together a record player made of paper, a pin, a pencil, and tape during a science class. Helmiyya is just one of ETI’s successful past Camp Rafiqi participants. As referenced in the quote above, our program participants learn many important life skills—including learning to use a white cane, as well as meal preparation, money management, and social skills—but what happens after learning them? In the real world, people with visual impairment will need to adeptly, and confidently, operate alongside sighted people. Many people think that they can’t, or shouldn’t be given the chance to do so. However, we believe that all have the potential to do so, and with the right practice, people with visual impairment can thrive. This is why ETI has designed an integrated camp to follow the Life Skill Program. But how are we able to achieve this? Inclusion is the core idea of everything ETI does, so when designing the curriculum, team members created two courses that instill this value in camp participants: identity and cogenerate dialogue. In cogenerate dialogue, teachers and students collaborate to identify and implement positive changes in a classroom's teaching and learning practices. The identity curriculum, on the other hand, seeks to cultivate independent thoughts of how we see ourselves within a community through a dialogue between peers, the creative process, literacy, and reflection. In the picture: a group of about fourteen students sit on chairs around a table, with two teachers (one standing, one sitting in a chair), and discuss "Symbolism and Storytelling." Understanding one’s story, and the idea that one belongs, is essential to full integration in society, especially for kids who have not always been included. For example, one of Camp Rafiqi’s current participants created a sculpture in art class, meant to represent herself using found objects, shown in the picture below. In the picture: A volunteer holds materials while a student creates a sculpture representing herself during an art class. In the picture: four children stand around a table with several records strewn about. A UNHCR representative (in a blue vest) and Tim Mauro, who stands and holds a paper cone, supervise the activity. Fostering individual creativity among the students is another way ETI seeks to instill a sense of empowerment in our participants. Creativity is encouraged in all classes that participants take, and this includes STEM classes. In the picture: Dr. Mona Minkara stands in front of a classroom full of students and teaches a science class. Anecdotes like these illustrate how Camp Rafiqi’s classes help the kids develop their creativity and instill in them the confidence that they bring value to society. Another example of a curriculum designed in this way is the art curriculum. Seeking to cultivate purpose, expression, and studio habits of the mind, Camp Rafiqi's art curriculum encourages technique and reflection, and children explore the process of making by using tactile, auditory, and olfactory sensitivities—which help students learn to not rely on sight alone. In the video below, a camp participant interprets the artwork of his peer to his teacher using the sense of touch (the dialogue of the video is in Arabic). The goal of fostering expression among the participants is also found in Camp Rafiqi's music classes. The music curriculum explores the fundamentals of music, which includes lessons in rhythm, percussion and found objects, and world music. An example lesson from the music curriculum is the Forbidden Rhythm Game, where students learn to distinguish between rhythmic sequences using a call and response method. Teachers demonstrate a unique rhythmic pattern that is “forbidden,” and the students must listen actively for it when it is hidden in a call and response activity. In this class, students improve their listening, rhythmic, and singing skills—all while learning to adapt to a set of rules. Despite all the learning and innovation happening within each individual class, the primary goal of participation in Camp Rafiqi is to just be a child and have fun. Many of the children with visual impairment have been shunned in the past from the normal activities of childhood, and this includes school and camp. By playing alongside other children, they receive the message that they deserve the same opportunities as any other kid, and that they belong. Teaching teamwork is just one of the many ways ETI instills the idea of belonging in its participants. One of the ways Camp Rafiqi participants learn team work is through our soccer curriculum. The soccer curriculum introduces and develops soccer skills—including dribbling, passing, shooting, and running—while teaching participants how to work on a team and to bring out the potential of their peers. In the picture: a group of about four children, to the left, watch a group of about four other children, to the right, practice a soccer drill in the corner of an open room while a volunteer supervises. The focus on team work is not just found during soccer instruction, however. 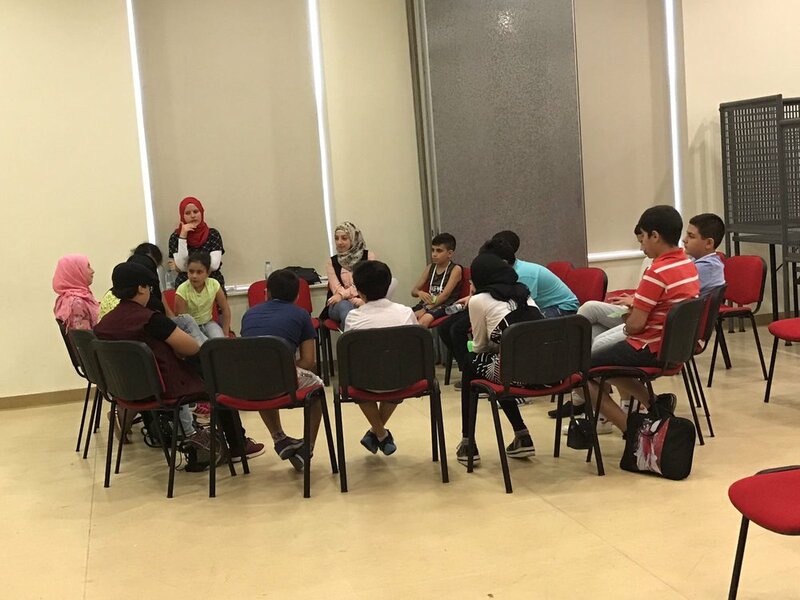 “We assure that students work in groups in order to improve the ability of group work, which they will have to use the rest of their lives, and every day we change the groups so they get used to integrating into society,” says a volunteer. After only one week, the impact that Camp Rafiqi has accomplished is extraordinary, and everyone involved feels excitment for what next week will bring.